We love Spot the Dog in our house, we must have at least 10 of the books by now. 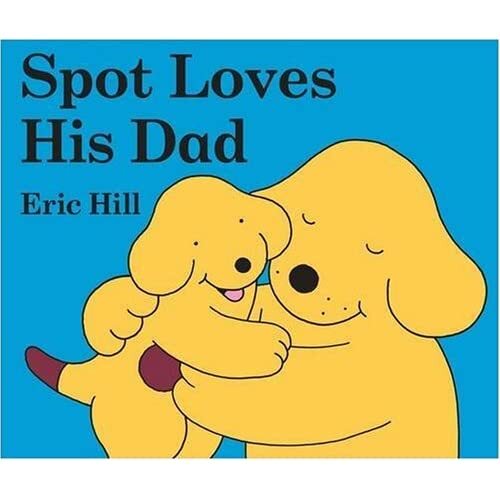 Spot Loves His Dad by Eric Hill was Felix's first Father's Day gift to his Dad. It's a book that Jonny and Felix regularly read together and it has a firm spot as one of Felix's all time favourite books. There are so many appealing things about the Spot books; basic language, large text, lots of repetition and lovely simple pictures with bright, bold colours. It is an uncomplicated story about a young dog and his Dad spending a lovely day together; feeding ducks, flying a kite, kicking a ball in the park, visiting the beach and at the end of the day they curl up in bed and read a book together. What young child could imagine a day better than this. The pictures in the book match the story beautifully and there are lots of opportunities to expand on what is written. Let's take, for example, the page above where Spot and his Dad visit the beach. First we can label the characters; Spot, Sam, and Mr. Bear. Next we can look at all the different objects; sun, boat, bucket, spade, ice-cream, ball, rug, ocean, sand, shop and shells. After that we can list all the colours and expand on our words; orange bucket, yellow sun, blue boat etc. And finally we can find all the shapes; the stars on the ice-cream shop, the sun is a circle, the boat has triangular sails etc. There is so much opportunity throughout this book to chat with your child and to give them the opportunity to use their words. Once you've been through the book a few times, labeling the objects etc, you can start to ask your child to point to specific items on the page and as their language comes on you can point to the object and ask what it is. Don't forget to be as descriptive as possible as you go; "where is the yellow sun? ", where is the orange bucket?". This can obviously be repeated on every page through the book, turning what might have been a 1 or 2 minute story into 10 or more minutes of bonding and learning. What Spot book is a favourite in your house? Do you have any other fun tips for reading these books with little ones?